Lindsay Mason: There and back again...and off again! Fellow Tolkien fans will recognise "There and back again" as the alternative title for The Hobbit, and I certainly feel quite Bilbo Baggins like with all my travels lately! It seems I'm no sooner back than I'm off again....well, tomorrow anyway. 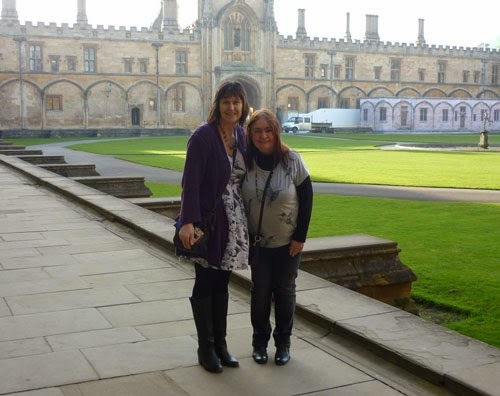 So, last Friday I took three trains down to Haddenham where the lovely Christina from A Maze of Memories met me and we then drove to the park and ride to pick up a bus into Oxford. This was something that I had been really looking forward to and I certainly was not disappointed. What a marvellous day it was. The shiveringly cold weather that began the day had given way to cloudless skies and sun that actually felt warm and made me squint....who knew I should have taken sunglasses?! 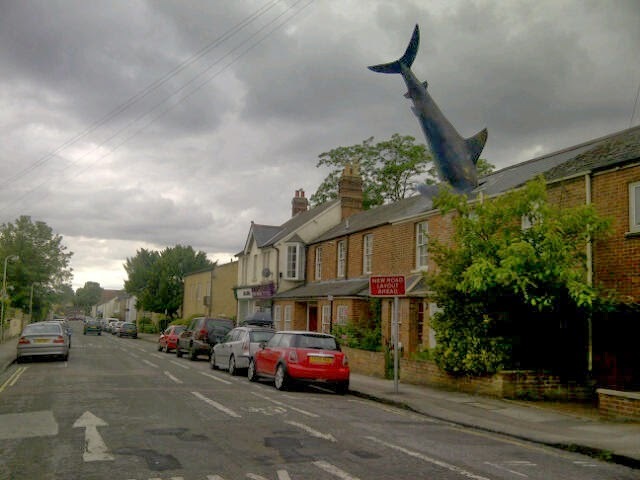 ...yep, a shark in the roof of a house! I didn't take this photo, but I did want to share the delight that this gave me! Bet the birds like to perch on that giant tail! ....isn't he/she wonderful?! Not very often that you get so close to such lofty figures. One of my favourite parts of the afternoon was looking around the Cathedral and college grounds of Christchurch. The walled gardens were just my cup of tea. The Great Hall was one of the inspirations for Charles Dodgson, aka Lewis Carroll, when he was writing Alice in Wonderland. As one of the expert guides told us, he was sitting by the great fireplace and the long necks of the firedogs on either side gave him the idea of Alice growing when she ate the cake! One of the stained glass windows has depictions of various characters from the book. The hall in the Harry Potter films was based on this room too. The walls are filled with portraits of former students - it must be quite intimidating for the current students as they dine at the long tables! .....a tiny Icon Diptych which will always remind me of a lovely day. So, after a rather exhausting afternoon I slept really well (until 5.45 am, when other hotel guests decided it was perfectly okay to stand outside my room talking...ggrrrr!!!) and it was soon time to get the show on the road at AMOM. 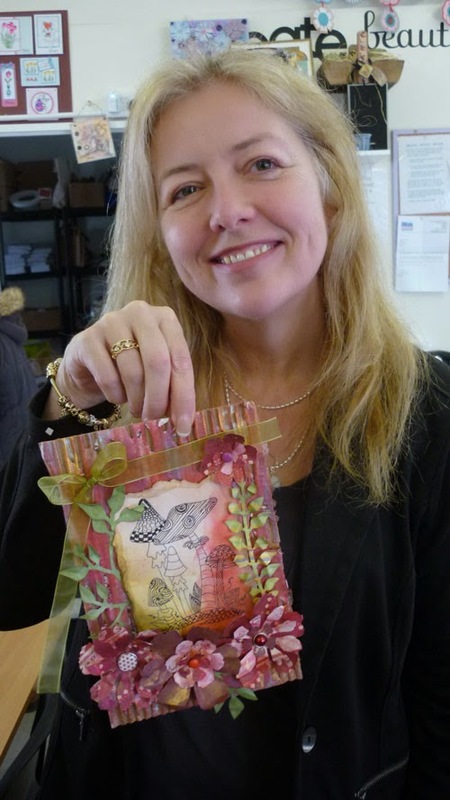 I was demonstrating my new stamps and there were also three make n take sessions. This was the sample that I had made to give the ladies their inspiration. I used thick corrugated card that was coloured with Distress paints and then rubbed with gilding wax. 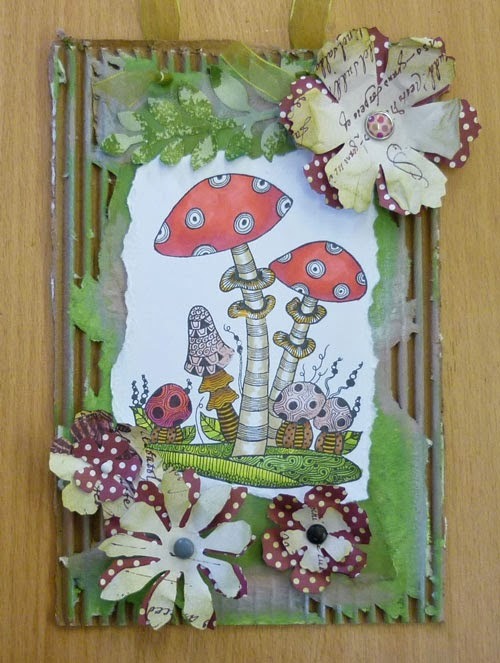 The image is one of my Zendoodle stamps - the ladies had a choice of the three different toadstool sets in the collection. Once doodled and coloured it was adhered to the panel and then embellished with Tim's tattered florals. 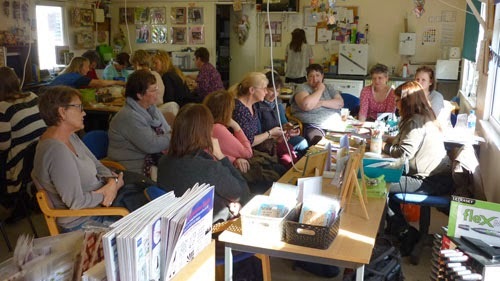 .....and here is a picture that shows what a busy day we were all having! You can see more of the fabulous work that the ladies did by clicking here. So, I must give a wave to everyone that came along and especially to Diane for the treats for my two terrors and honey for me, also to Julie who I hope to see at the NEC and to Miriam, Mary and Christina for all their hard work in making the day so special. One extraordinarily heavy suitcase (those Sizzix Bigz XL dies weigh a ton! ), my Tim Holtz bag, filled with everything from socks to die cut flowers, and my canvas bag filled with my dimensional Sizzix samples. Wish me luck...I think I'll need it! ....the drawings around the edges of the insert are there to give some ideas for different Zentangle designs. Wow, that was a rather picture heavy post! I'm going to get myself into my PJ's now so I can watch the Sewing Bee in comfort with a hot coffee and a yogurt (strange combination I know!). Thomas is already picking up on the fact that I'll be leaving them again, so he will be getting some extra cuddles tonight! Tara doesn't seem to worry as much so long as she gets her grub, although she always goes mad with excitement when I get home...Thomas usually lets me know that he's very annoyed with me! I hope to see lots of you at the show over the next few days. I'll be on the Card-io stand where you can also see Wendy working magic with her own range of stamps. I'll report back after the weekend. Finally, welcome to my latest blog followers and hope you will enjoy my ramblings! Have a great time at the show....hard work I know....wish I was going...maybe next year! Great to see you as always Lindsay and your fab samples !! Have a super time at the NEC !! You're such a talented teacher, I love the work your ladies produced with your inspiration and they're all so different! Thanks also for sharing the picture of your milk carton, it's super cute!